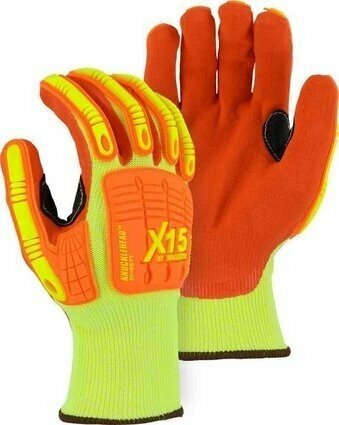 Majestic X15 Knucklehead Cut Resistant Level 5 Glove comes in hi vis yellow and gray/white colors. Majestic 35-557Y gloves feature HPPE yellow knit liner shell with orange oil and waterproof double sandy nitrile coating. They have a reinforced thumb crotch and are impact resistant. 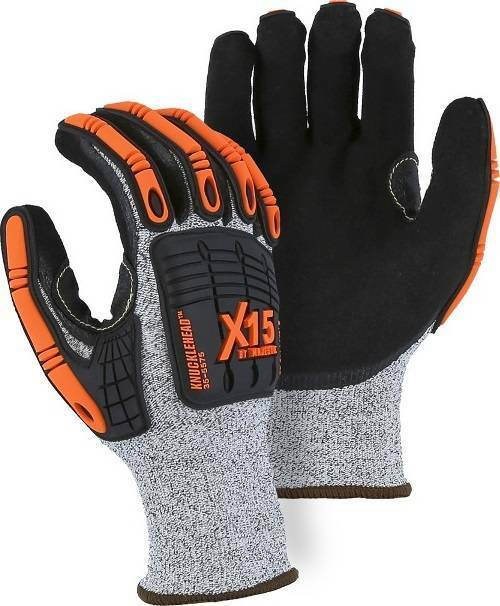 Majestic 35-5575 gloves feature HPPE black/gray shell with black oil and waterproof double sandy nitrile coating. They have a reinforced thumb crotch and are impact resistant. Double sandy nitrile palm coating to prevent oil & water permeation. Thermo Plastic Rubber (TPR) back for impact protection. Pre-curved to minimize hand fatigue. Cut Level: CE 5/ANSI 4. Available in 2 colors - Hi Vis Yellow and Black/Gray.